Derek Hill just needed to be healthy. Derek Hill just needed to be healthy -- and to hit. The talent has always been there for the Tigers' 2014 first-rounder, specifically when it comes to his plus-plus speed and ability to track down balls in center field. But there was the quad injury that limited him to 53 games in 2015 and the Tommy John surgery in August 2016 that kept him out for much of 2017 as well. Then there was his .239/.307/.318 line last season at Class A Advanced Lakeland; his .625 OPS ranked 46th out of 53 Florida State League qualifiers. Now here's the thing about Hill at this moment. It's only been five games with Double-A Erie. Only five. But two things are true -- Hill is healthy and Hill is hitting. Both are a start. "Personally, this is the player I should have been all along," he said, "and it's what I can be going forward. What I've been trying to do has made me realize how to play the game looser instead of treating it like a job. That gets lost sometimes. This is a game. It's supposed to be loose." Hill has shot out of the gate in his first taste of Minors' second-highest level, going 9-for-22 (.409) through his first five games with the SeaWolves. Batting from the right side, he had multiple hits in three straight contests to open the season -- a feat he achieved just once all of last season (July 10-13) and only four times total in his five previous Minor League seasons entering 2019. His biggest game Sunday against Trenton was impressive for multiple reasons. First, he hit a leadoff homer off Thunder starter Albert Abreu, the Yankees' No. 3 prospect, a hard-throwing right-hander with an above-average curveball and an above-average changeup. Hill yanked the long ball to left on Abreu's first pitch of the afternoon, showing an aggressiveness and confidence not usually befitting a hitter with a career .654 OPS. He added a three-run double and a sacrifice fly to finish with a career-high five RBIs in a 16-5 win. Following Tuesday's 1-for-3 showing, Hill sits in a three-way tie for the Eastern League lead with nine hits, and his .409 average, .682 slugging percentage and 1.098 OPS all rank among the top seven qualifiers on the Double-A circuit. Again, this is all part of Small Sample Theater, but it does pick up from Hill's uptick in performance at the end of the 2018 season. He hit .275/.363/.377 in 24 games in August with Lakeland, and while there wasn't much power in that performance, his average was 20 points higher than in any previous month and his .739 OPS marked the first time that number jumped above the .700 mark in a single month. With a 116 wRC+ in August, Hill was at last slightly above-average with the bat in the FSL. For comparison, he had a 76 wRC+ from April through July. That was, in part, because Hill and the Tigers had tried a number of adjustments in his batting stance to unlock something, anything in his offensive profile before eventually settling back on what makes Hill a promising prospect in the first place -- his kinetic energy in all phases of the game. "My hitting coach last year [Tim Garland], he worked with me throughout the whole season, tinkering with this and that trying to get something right before we came across something that clicked for both of us, that looked pleasing to both of our eyes," said Hill. "I got back to more of a fluid motion instead of something that felt more robotic at the beginning of the season. ... It's just more balanced with me trying to stay in my legs a little better as I get back to that fluid stance. It's where I'm more comfortable." It has showed early on with three extra-base hits in Hill's first five Double-A games. While he's undoubtedly been the beneficiary of some batted-ball luck with a .500 BABIP, Hill also is changing the types of balls he is putting into play as a result of his newfound comfort at the plate. He's not quite ready to join the flyball revolution, but his ground-ball rate has fallen from 48.5 percent in 2018 to 35.7 percent in the early going. Conversely, his line-drive rate has absorbed much of the change going from 18.6 percent to 28.6, entering Tuesday. So while Hill's no-doubter against Abreu may have raised more than one eyebrow, it's not quite a sign that he's going to go from 30-grade power to even just average pop, at least not yet. "I'm still a gap-to-gap guy," Hill said. "I might show some power here and there, and I know I'll eventually grow into even more. But right now, I'm trying to be a guy that can really send it into the gaps with some low line drives. If I can get it in the gap, that's going to play into one of my best tools with my speed, and I want to take advantage of that." One thing is for sure -- the 23-year-old is getting back to enjoying the game. He's on a quality Erie team that features notable prospects such as Matt Manning, Isaac Paredes, Jake Rogers, Alex Faedo and Sergio Alcantara. As part of the organization's growing focus on the farm system, Hill notes the Tigers have become more detail-oriented, specifically when it comes to the way in which their players hustle (perfect for a player with four seasons with 25 or more steals in the Minors). But more than anything, Hill is happy to be playing again. 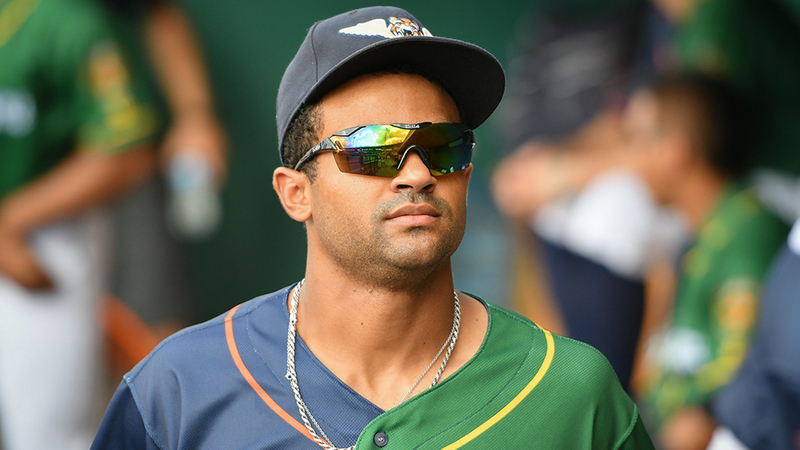 Coming off the first season in which he played more than 100 games, the 23-year-old has started all five of Erie's contests to open 2019 -- four in center field, one in right, all out of the leadoff spot. Health worries may be his past, but right now, they are not his present. "Injuries are a part of it feeling like a job, sure," Hill said. "When you're not playing baseball every day like you want to be, you're forced to see all the other aspects. But I know it's something everyone goes through. The process was tough, but I had a couple guys go through rehab with me. Anthony Castro was one of them down there with me, and we really gelled and he's here with me now in Erie. You have to lean on those guys or else you'll have a breakdown. You have to stay positive. After an [elbow] injury like that, it's all you can do to just go out there and do each step you need to get more ready than you were the day before." Hill entered the 2019 season not ranked among the Tigers' top-30 prospects. He was eligible for the Rule 5 Draft last December but went unprotected and unpicked because of his health and hitting questions. He's since been passed by Daz Cameron (currently in Triple-A Toledo) on the organizational depth chart in center. But right now, he's healthy and hitting, and that's all Hill could have asked for to begin his sixth Minor League season. "It loosens you up for sure," he said of his hot start. "It does make it easier to stick with the gameplan you had coming into the season and sticking with what the coaching staff tells you every day. But the main objective right now is staying healthy, continuing to work and enjoying my time playing with this group of guys. Everything else will come."